Lucas van Leyden was a painter, draughtsman and printmaker who worked in the Low Countries in the early 16th century. Considered to be one of the finest representatives of Dutch genre painting, his approach reveals the influence of Italian painting, which he must have known through prints by Marcantonio Raimondi, and of Jan Gossaert’s work. Lucas van Leyden was greatly admired in his own day and although he did not take on pupils or assistants he had numerous followers. He repeated the subject of the present work on numerous occasions, depicting informal groups with various figures. 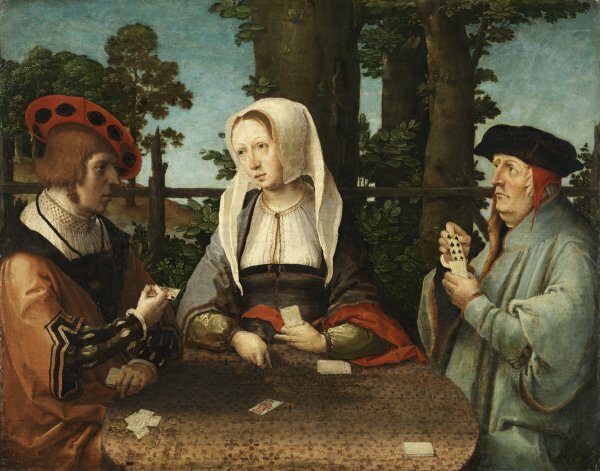 This panel shows two men and a woman enjoying playing cards, a composition that has been interpreted as an allegory of love in which the young man on the left holding the king of spades is the winner. It has also been suggested that the painting has a possible political significance and the figures have been identified, from left to right, as Charles V, Margaret of Austria, regent of the Low Countries, and Cardinal Thomas Wolsey, Ambassador to Henry VIII of England. The subject would thus refer to a possible pact of the three powers against the French king. Much of the information known today on Lucas van Leyden comes from Karel van Mander’s account of his life. Van Mander states that the artist’s father, Hugo Jacobsz., was his first teacher, followed by Cornelis Engebrechtsz. He also notes that Van Leyden was a talented and precocious student, a fact that is confirmed by the date of his first work, an engraving of 1508, executed when he may have been no more than fifteen. In addition to working as a painter, Van Leyden was highly active in the graphic arts and combined his activities as a painter throughout his career with that of printmaking, for which he was internationally renowned. Van Leyden met Dürer during the latter’s trip to the Low Countries. They met in Antwerp in 1521 and exchanged prints. Dürer also drew his portrait, now in the Musée des Beaux-Arts, Lille. Only a small number of paintings have been attributed to Lucas van Leyden and this catalogue was gradually reduced over the course of the past century. Karel van Mander referred to four paintings that he considered to be the artist’s masterpieces, all on religious subjects and dating from between 1522 and 1531. Lucas van Leyden’s surviving paintings consist of small-format religious compositions, a number of portraits, and various scenes such as the present one of informal gatherings in which the participants play chess or cards, a relatively uncommon pastime at this date. In the present panel we see a woman flanked by two men seated around a circular table that occupies the foreground of the painting. On the table top, which has a print of fleurs-de-lys, are a number of small stacks of cards and piles of money. The woman, positioned frontally, points to the jack of spades while the young man on our left has the king of spades in his hand and looks at the other man who shows him the eight of spades. The scene takes place in an exterior that contains a limited number of elements, including a tree trunk, a rustic fence and an area of blue sky. In comparison to other images of this type by the artist and bearing in mind the particular arrangement of the composition, the seriousness of the figures and their relatively small number, the painting may contain a hidden meaning. It has been suggested that it is a possibly an allegory of love in which two men are rivals for the woman’s favours and in which the young man on the left has the advantage, indicated by the king of spades in his hand. The painting has also been read in a political key, in which the three figures could be Charles V on the left, Margaret of Austria, regent of the Low Countries, and Cardinal Thomas Wolsey, ambassador of Henry VIII of England. This encounter would symbolise the pact between Charles and Henry against the French monarch. Using more figures, Lucas van Leyden painted other scenes of card players set in dark interiors, for example the early Chess Players of around 1508 (Gemäldegalerie, Berlin), The Fortune Teller (Musée du Louvre, Paris) from around the same date, and The Card Players of around 1515 in the collection of the Earl of Pembroke in which the room opens onto a simple landscape.